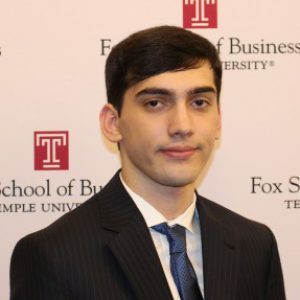 I am currently a sophomore at Temple University. I am interested in the software side of business. After taking MIS 2101, I learned about systems that assist businesses on expanding and developing. This really interested me so I declared Management Information Systems as my major. To further my passion, I joined a student professional organization, the AIS (Association for Information Systems). I am interested in learning ways companies leverage technology in their organizations. I am also passionate about accounting which is why I am also an accounting major. I was a Scrub Daddy accountant intern this past summer and it showed me how important accounting is to an organization. To get involved in accounting organizations I joined the FAA (Fox Accounting Association). To experience completing tax returns first hand I joined the Volunteer Income Tax Assistance Program at Temple University. Although this highlights my current involvements, I plan on continuing to expand my knowledge in Management Information Systems and Accounting.